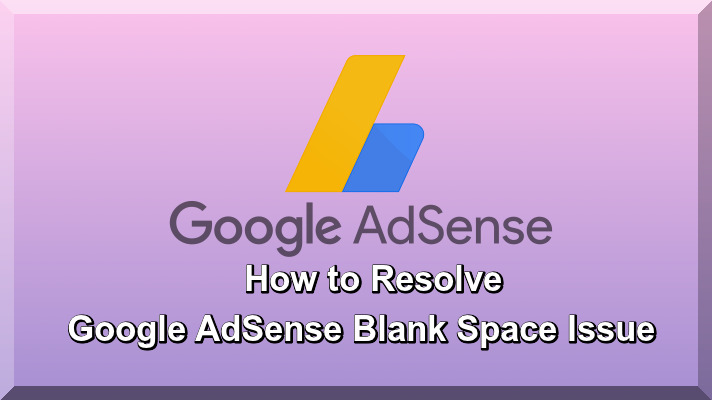 This tutorial is useful like other tutorials, now I guide you that why Google AdSense showing blank spaces on Ads. Some ads not appearing on the blogger blog or Website, specially this problem comes on sidebar. Google AdSense shows blank spaces and we are getting in trouble. It by and large happens on the blogger blog or Websites that incorporate numerous language. On the off chance that your substance language doesn't coordinate with advertiser and Google TOS, at that point It will demonstrate Clear Space Advertisements. On the off chance you see that no advertisements are appearing in your blogger or Website, at that point don't get stressed once in a while it may occur for some other reasons which I describe on the following points. Now I guide you step by step how to fix the issue of Google AdSense not displaying ads on your blogger blog or Website. You are new blogger or Website owner, you have got approval from Google AdSenese if you have not get approval yet get Google Adsense Approval read this tutorial. First note the following points and make sure that you are done. First go to your blogger Blog Dashboard and than go to "Earnings" and ad your ads through Gadget click on the Gadget go to Adsense and chose your ad as per your requirement. If the Ads not working properly go to your AdSense account and select your required ads and paste the code of Asynchronous in blogger blog, sidebar only and use your header and footer ad through Gadget. Header and footer ads working best through Gadget do not change it. Go to Microsoft Edge Browser and make sure that your sidebar ads or other ads not showing "http: 400 error" if you found "http 400 error", once again go to Google AdSense Account and copy and paste Asynchronous code and replace it, the matter will be solved. Do not use more 03 Ads on your "Home Page" add only 01 code in Blogger Header, 01 Code in your Blogger Footer, 01 Code in your Sidebar try to add 300x600 code in sidebar, 728x90 in Header, 300x280 in Footer. Do not use large number of ads on your blogger blog, no problem Google allowed much ads after 2016, but large number of ads creating blank space problem due to some your contents not matched with clients ads. Do not add Google Ads below of Flash Videos, Audio players, but write something and do not use only images audio or video, but write some article contents. As per new policy Google provide more facility such as "Matched Content Ads", "In-article Ads, such type of ads, add in your blogger post separately. Check your Blogger or Website Ads on another computer that all are working properly, often the problem comes time to time opening of your blogger or Website continuously by yourself. Do not add Ads in between your contents, add only allowed Ads as "Matched Content Ads", "In-article Ads. Avoid from amendment in Google AdSence codes, and do not implement on wrong ways, peoples misguide to others through videos, and wasting their time and also others. I hope above all points will be helpful for new bloggers and Website owners, do not take in tension this is not big issue and remove your extra codes and go to limit as per Google AdSense Policy and all note all above points which I have discussed, I think your problem will be solved. This tutorial is very useful like other tutorials, if your like it or any confusion leave your comments, I will be guide to all visitors any time.